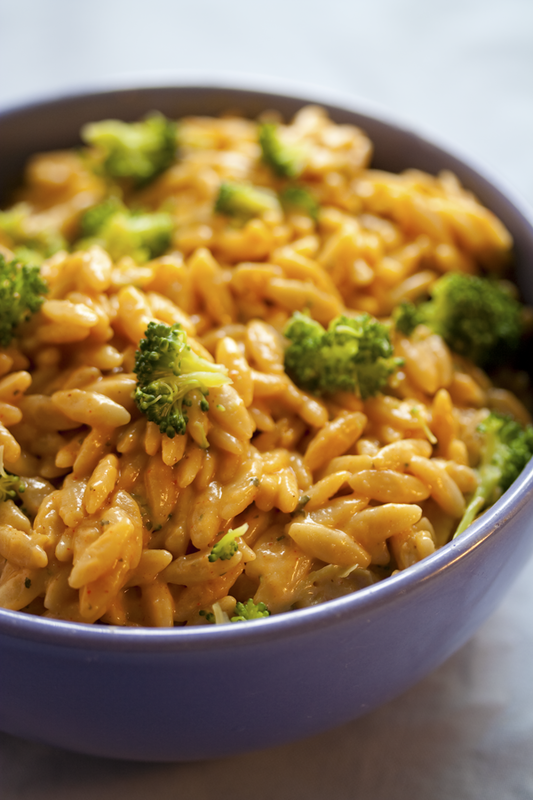 A deliciously cheesey tasting broccoli and orzo dish. I created this recipe to mimic Rice-a-Roni's Broccoli Au Gratin, a favorite of mine before I became vegan. This dish is very quick. It will be on the table in less than 30 minutes. Only 5 grams of fat and packed with over 11 grams of fiber per serving! Want to know what others thought about this recipe? Would you like to comment on this recipe? Go to the Cheezy Broccoli Orzo blog entry. In a large pot, bring water to a boil. Chop broccoli into bite size pieces and put into pot with water. Cook for 6 minutes and fish out with a large slotted spoon and set aside. Now pour orzo into the same pot and cook for 10 to 12 minutes. While the orzo is cooking prepare the cheeze sauce. In a blender place; olive oil, vegan butter, rice milk, flour, corn starch, paprika, onion powder, seasoned salt, sea salt, black pepper, marjoram and garlic powder. Blend until smooth. After the orzo has finished cooking, drain the water completely. Place pot back on the stove and turn heat down to medium to low. Pour cheeze mixture in with the orzo and cook for 3 minutes, stirring occasionally. Take off heat and let stand for 10 minutes before eating. 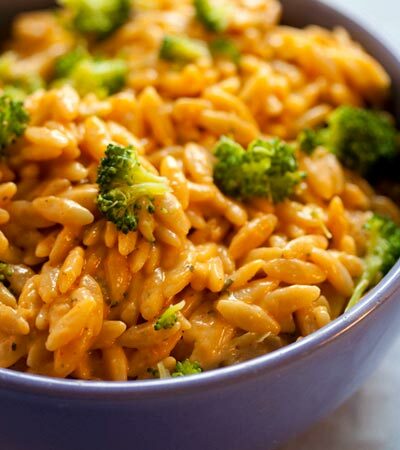 You can add the broccoli to the orzo and mix it together or eat it separately. Personally I like putting the broccoli to the side.